June | 2013 | Receiving. 53-year-old female presents to the ARC complaining of pain in her right eye over last 24 hours. She began to notice some redness in the right eye during the day yesterday, but as the evening wore on last night she noticed a sharp pain in her right eye and worsening redness. She has not noticed any clear or purulent discharge from the eye. She states she has always had some sinus congestion providing a sensation of pressure behind both eyes, but this feels no worse today. She states the pain seems to be worse when she looks into bright lights, and gets better when she goes into dark places. She is not noticing pain when moving her eyes. She does report that she has had some decreased vision in the right eye when compared with the left. She never had anything like this before and denies trauma to this eye. She has not had any medications for her eye pain. SH: Pt lives at home. Pt denies tobacco and illicit drug use. Pt denies alcohol use. Constitutional: Well-developed, well-nourished, patient is alert and oriented x3. She is seen moving her head comfortably in all directions, cooperative and interactive on exam. Eyes: Extra-ocular movements are intact in all directions without pain. Pupils are equal at 3 mm, and reactive to light. Bilateral pupils are symmetric. Patient has erythema of the conjunctiva of the right eye worse immediately adjacent to the iris and improving distally. When light is shined in the right eye the patient experiences pain in the same; when light is shined in the left eye, she reports pain in the right eye. She has no pain relief with proparacaine instillation. Pressures in the bilateral eyes averaged 14 mmHg. No fluorescein uptake is appreciated in bilateral corneas. Slit-lamp examination reveals no cell or flare in the anterior chamber of the bilateral eyes. Visual acuity is 20/50 in the affected eye and 20/25 in the unaffected eye. No swelling of the soft tissues appreciated peri-orbitally bilaterally. Mouth: No erythema or exudates in the posterior pharynx, tonsillar lymph nodes are not enlarged. Neck: Supple, no meningismus, no anterior cervical lymphadenopathy. Skin: No rash, no diaphoresis. Neurological: No facial asymmetry/droop. Patient is able to shake hands with expected strength and is moving all of her extremities spontaneously. Sensation is appreciated as normal in all extremities. No aphasia or dysarthria, tongue protrudes midline. Normal gait. Question #1: What is the most appropriate treatment for this patient’s diagnosis? Question #2: Iritis, unlike acute angle-closure glaucoma, is not an immediately vision-threatening disease. However, these patients do require rapid Ophthalmology follow-up (ideally within 24 hours). This patient was seen late in the evening in the ARC, but an appointment was made for the patient the following morning at the Ophthalmology clinic. Which investigative study might be considered prior to this patient’s discharge? Question #3: During your next shift in the ARC one week later this patient presents with a chief complaint of “foreign body in left eye”. She reports that her right eye symptoms have almost completely resolved. However, she reports that she has been keeping her eye drops in her desk drawer…. the same drawer in which she also keeps her super glue. One hour prior to arrival she placed three or four drops of what she thought was Pred-forte into her left eye but immediately noticed that her eyelids were sticking together. After realizing her mistake she attempted to flush her eyes with water but presents now for evaluation. On exam you remove some pieces of hardened glue from the conjunctiva. The palpebral conjunctiva appears to be adhered to the sclera in the upper, outer quadrant and fluoroscein staining reveals a generalized uptake over the entire surface of the cornea. In addition to removing any large pieces and flushing the patient’s eye with water, which medication will you provide this patient? Keratic precipitates on the posterior surface of the cornea. Iritis can be classically differentiated from conjunctivitis with erythema immediately adjacent to the iris which improves distally, while conjunctivitis classically shows distal erythema with perilimbic sparing (shown below). Patients with acute angle-closure glaucoma experience worsening pain with pupillary dilation secondary to blockage of the trabecular network draining into the canal of Schlemm – this is the cause for worsened pain when walking into a dark room. Inflammation of the ciliary muscles causes pain with constriction and worsened pain with light exposure. The consensual light reflex causes pain in the affected eye even when light is shined in the opposite pupil (as was noted in this patient). More severe inflammation can result in a “frozen” pupil that does not constrict with light (causing photophobia), or an asymmetrical pupillary constriction (see below). Also noted in this image is an hypopion, a late finding appreciated in patients with iritis. The most appropriate medication for treatment of this patient’s iritis is homatropine. Homatropine is a muscarinic antagonist used as a cycloplegic to temporarily paralyze accommodation and thereby eliminating pain. Patients are encouraged to instill one drop in the affected eye four times daily. However, note that homatropine is used for symptomatic treatment. Iritis is also typically treated with Pred-forte (Prednisolone eye drops) to limit inflammation, but patients should typically be evaluated by an Ophthalmologist prior to initiation of this treatment and delay 12 – 24 hours has not been shown to affect the outcome of the disease. This patient has no evidence of pre-septal or orbital cellulitis and there is no utility in initiating oral or intravenous antibiotic therapy. Beta-blocker medications are used in the treatment of glaucoma, and will likely worsen a patient with iritis. Compresses and topical antibiotics are the mainstay of conjunctivitis but have not shown utility in the treatment of iritis. Although most cases of iritis are idiopathic and presumed to be secondary to a viral infection, there are a number of less common causes that should at least be considered in patients presenting to the Emergency Department with iritis. These include all of the auto-immune diseases (ankylosing spondylitis, multiple sclerosis, inflammatory bowel disease, sarcoidosis). HLA-B27 is associated with ankylosing spondylitis and a chest x-ray may be used to evaluate for sarcoidosis, but neither of these studies must be performed in the ED. There is no utility in a CBC or electrolytes in this case. However, iritis may be an early manifestation of secondary syphilis or a reactive arthritis such as Reiter’s syndrome. As these diseases pose significant risks to patients and the population at large, the patient’s physical examination and social history may prompt a physician to obtain an RPR (and DNA probes for Gonorrhea and Chlamydia). Patient’s very commonly present to the ED with foreign bodies in the eye. Following a thorough history and physical examination, effort should be made to remove the foreign body and fluoroscein staining should be performed to ensure no corneal damage (in this case, the fluoroscein uptake across the entire cornea is likely secondary to a fine coating of super glue, rather than corneal injury). Symptomatic treatment and follow-up with an Ophthalmologist is typically appropriate. However, there is some anecdotal evidence that erythromycin ointment (not drops) facilitate rapid degradation of super glue and should be provided to these patients at discharge. Patients should also be encouraged to keep their super glue in a separate location. HPI:Patient is a 26-year-old male history of depression and recently diagnosed bipolar disorder. The patient states he tried to kill himself with “300 unknown pills.” The patient states he took 30 in each mouthful until they were all gone. The patient is having nausea and has vomited. The patient is highly agitated he states he is feeling warm and dehydrated. Patient states his heart is beating real fast. His mother is en route behind EMS and she states she found 6 empty bottles of No doze 200mg maximum strength caffeine pills behind the patient’s house. The bottles contents included 50 Tabs each. Consitutional/Psychiatric:The patient was awake, sitting upright actively vomiting. He was highly agitated and vomiting. Patient was morbidly obese BMI 51.7. 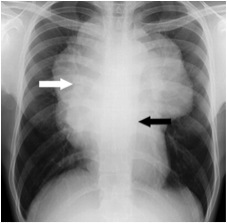 Chest: Symmetrical, heart can be seen bounding through chest wall. Musculoskeletal and Extremities: Hands, fingers and nails were free of deformity, or lesions. There was no tenderness and no edema. Strength 5/5 upper ext to bicept &tricept activation against resistance Lower Extremity 5/5 to hip and knee flexion against resistance. Patient is awake alert and oriented to person, place, and time, normal speech and hearing, face symmetrical, sensation is equal and intact throughout, patient is highly agitated he does have intermittent twitching of his right lower extremity. Reflexes were hyper-reflexive in brachioradialis and patellar bilaterally equal. 1.) What is the reported weight based lethal dose of oral caffeine? 2.) Given the lab/ekg and rate at which potassium can be replaced on an IV -(see Dr. Levy recent lecture,) what is the most appropriate antiemetic to use in this patient to prevent further GI K+ loss? 3.) What is the correct initial combined medical and decontamination therapy for this patient? 4.) 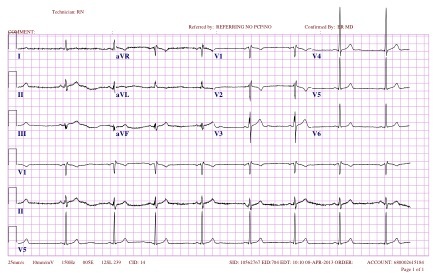 If this patient should become immediately hypotensive, what is the preferred initial vasoactive agent? The reported lethal oral dose is 10 g (150–200 mg/kg), although one case report documents survival after a 24-g ingestion. In children, ingestion of 35 mg/kg may lead to moderate toxicity. Coffee contains 50–200 mg (tea, 40–100 mg) of caffeine per cup depending on how it is brewed. No-Doz and other sleep suppressants usually contain about 200 mg per tablet. “Thermogenic” dietary supplements, which are sold as energy beverages (eg, Red Bull), bars, capsules, tablets, or liquid drops, contain the equivalent of 40–200 mg of caffeine per serving as either concentrated plant extracts or synthetic caffeine. Given this patients body weight and stated dose =60,000 mg of caffeine patient estimated level is 357mg/kg! Way over the highest reported case report of survival! Caffeine is a is a trimethylxanthine that is closely related to theophylline. It acts primarily through nonselective inhibition of adenosine receptors. Given the shifting of K+ that can occur because of this inhibition as well as the stimulated GI losses patients who present with toxic ingestion almost always have a severe hypokalemia. The problem is that the patient is actively vomiting and can not take oral K+ and IV 20mEq would take 2 Hrs to safely replace. In this case we were instructed to stay away from the 5HT3 agents as the patient EKG QTc was 532 likely from his chronic use of oxcabazepine. 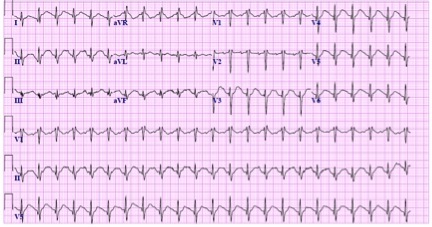 Alkinalization with bicarb to is an option but given the hypokalemia it may potentiate torsades. Tigan action is unknown if it causes QTc prolongation and can not be used IV form and is only usually in oral formulary. Recommendation was for use of reglan at 0.2mg/kg for initial dose and increase if necessary to 0.5mg/kg max. Metoclopramide blocks dopamine receptors in CNS and increases upper GI motility through sensitization of acetylcholine. After 33mg of metoclopramide the patient stopped vomiting in order for us to push K+ down his NGT! Replacement of K+ with concomitant mg++ replacement is key to the hypokalemia with a methylxanthine overdose. Benzodiazepines are utilized for seizure prevention and for catecholemine surge. People with caffeine overdose have a high mortality with seizures and Phenytoin has been found to increase mortality with cases of methylxanthine induced status epilepticus. Charcoal is the accepted method of decontamination. In this patient inital charcoal was carefully given via NGT only after the risk of vomiting and aspiration subsided. 100g initial followed by 25-50g every 2hrs for up to 8 hrs. In Caffeine with overdose there is considerable beta1– and beta2-adrenergic stimulation secondary to release of endogenous catecholamines. This is not seen with chronic caffeine use toxicity. Although it seems counterintuitive, Beta blockers effectively reverse cardiotoxic and hypotensive effects mediated by excessive beta-adrenergic stimulation. Treat tachyarrhythmias and hypotension with IV propranolol, 0.01–0.02 mg/kg or esmolol, 0.025–0.1 mg/kg/min beginning with low doses and titrating to effect. If vasopressor drugs are required, or phenylephrine is recommended to avoid the potassium-lowering effects of catecholamines. There were many pitfalls to this case and there was a good outcome. The patient was discharged in 5 days after psych clearance. The patient lived and did not have seizure or life threatening arrhythmia I believe due to the swift plan of the poison control center and the communication with everyone involved nurses, techs, ICU, psych on the strict adherence to the goals of care with close observation as any one of the medical treatments could have lead to a bad outcome if calculated wrong or given at the wrong time in the clinical course. -Special thanks to Dr Aaron for making this case a teaching pearl and for a thorough consultation as I was by myself for the first time and happened to get this patient. 24 year-old male presents to the emergency with complaints of chest pain, he points to the left upper sternal border and left upper chest. He reports it began about a month ago. He describes it as a constant, dull pressure. He reports the intensity of the pain has significantly increased over the past 5 days and is now radiating to the right side of his chest. Patient has not tried anything to alleviate this pain. He reports taking a deep breath exacerbates his pain. He denies any fevers. He reports a dry cough that is non productive, which he attributes to smoking. He denies any trauma or dyspnea. Constitutional: Denies night sweats, fatigue or weight loss. Social Hx: Patient smokes cigarettes daily, and marijuana occasionally. Denies IVDU or Cocaine. Reports to socially drinking less than 3 times per month. General/Psychiatric: WNWD non-toxic appearing male sitting upright in the stretcher in no acute respiratory distress, speaking in full sentences. A&Ox3. HEENT: NC/AT PERRL EOMI. No nasal discharge, or nasal flaring.. Mucous membranes of the mouth are moist. No tonsil enlargement no erythema. Neck: Supple, No JVD Trachea Midline. Full Range of Motion, No lymphadenopathy. 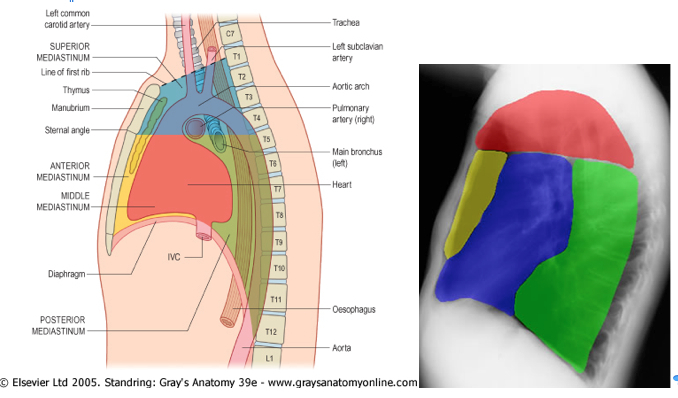 Chest: Left sided chest wall tenderness to palpation – front back level?. Respiratory: CTAB no wheezes rhonchi or rales. Cardiovascular: S1S2 present no M/R/G. Abdomen: Thin Soft ND/NT no rigidity or rebound tenderness. Musculoskeletal: Strength 5/5 in the upper and lower ext. Palpable and symmetric radial and dorsalis pedis pulses. No edema or asymmetry. No tenderness to palpation. 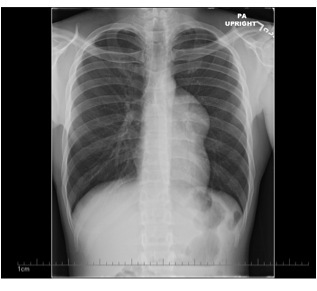 Neuro: Normal speech and gait..
1) Where is the abnormality located in this patients chest radiograph? 2) Which of the following statements is correct? a) The anterior mediastinum extends from the sternum anteriorly to the esophagus posteriorly. b) The anterior mediastinum contains the thymus gland. c) The anterior mediastinum contains the transverse arches of the aorta. 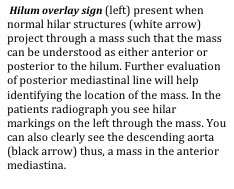 d) The middle mediastinum contains the esophagus. 3) Which is the most appropriate next step in this patient’s management? a) Obtain blood cultures, start antibiotics and consult cardiothoracic surgery. 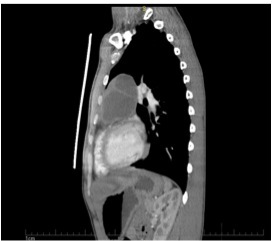 b) Obtain a CT-Thorax with contrast. c) Obtain a Transthoracic Echocardiogram. d) Perform a Color Doppler Ultrasound Guided Thoracentesis. e) Start the patient on Heparin and admit to the hospital. 4) Which of the following is the most common tumor of the anterior mediastinum? 5) What is the initial diagnostic study of choice? 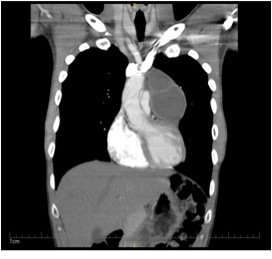 6) Bonus Question: What was this patient’s final diagnosis? Brief review of radiographic anatomy eliminates b, c, d.
Patient’s Radiograph: The radiograph does demonstrate two findings helpful in identifying the location of the mass. See below. The Middle Mediastinum– lies between the anterior and posterior mediastina. Posterior Mediastinum– bounded by the pericardium/trachea anteriorly and the vertebral column posteriorly. Superior Mediastinum– bounded superiorly by the thoracic inlet and inferiorly by and arbitrary plane passing horizontally and posteriorly from the manubriosternal joint to the junction of T4/T5 vertebra. Anteriorly bounded by the sternum and posteriorly by the upper thoracic vertebra. 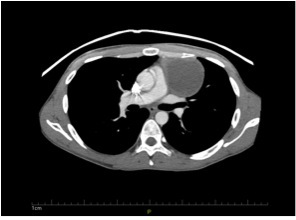 3) Answer: b. CT Thorax w/ contrast should be ordered next. (Explanation below). The most common causes of anterior mediastinal masses: Thymoma (20%) Germ Cell Tumors (seminoma, teratoma, etc(15%)); thyroid disease (15%); and lymphoma HD and non-HD (10%). Masses of the middle mediastinum are typically congenital cysts. 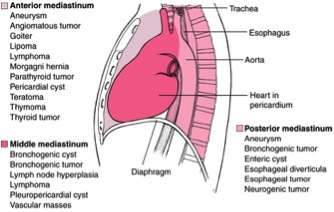 Neurogenic tumors are the most common cause of posterior mediastinal masses. Overall, two thirds of mediastinal tumors are benign, however masses in the anterior compartment are more likely to be malignant. The clinical sequelae can range from asymptomatic to symptoms of cough, chest pain, dyspnea, and fevers/chills. The likelihood of malignancy is influenced by mass location, patient age, and the degree of symptoms. Age is a strong predictor of malignancy, lymphomas and germ cell tumors (GCTs) occur mostly during the second and fourth decades. Symptomatic patients are more likely to have a malignancy. Symptoms may be delineated between localizing symptoms (mass effect) and systemic symptoms (hormonal/antibody effect). In Davis et al,7 85% of patients with a malignancy were symptomatic at presentation, compared to 46% of patients with benign neoplasms. 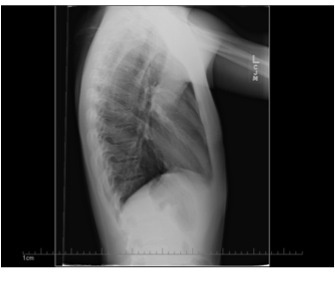 The initial workup of a suspected mediastinal mass involves obtaining posteroanterior and lateral chest radiographs. CT scanning is used to further characterize mediastinal masses (cystic, vascular, and soft-tissue structures) and their relationship to surrounding structures. 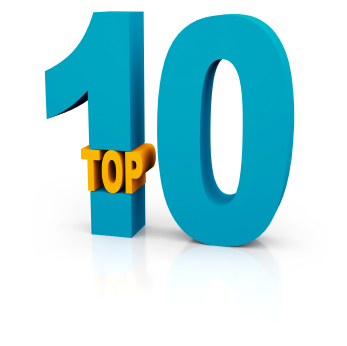 Other more rare imaging modalities include, fluoroscopy, and barium swallow. MRI may be used in evaluating a neurogenic tumor, and identifies vascular invasion and cardiac involvement. Tissue diagnosis is almost always required. Biopsy may be obtained via, transthoracic or transbronchial needle aspiration, mediastinoscopy, anterior mediastinotomy, or video-assisted thoracic surgery. Modality of choice is sometimes case dependent. Fluoroscopic or CT guided transthoracic needle biopsy, has been shown to be faster, cheaper, and better tolerated by patients. It has been shown to have good diagnostic accuracy, although sometimes specimens are inconclusive requiring further investigation. 5) Answer: CT Guided Transthoracic Needle Biopsy, however some evidence suggests Thoracoscopic biopsy is just as safe and slightly more accurate. 5) Anterior mediastinal masses: utility of transthoracic needle biopsy. Department of Radiology, Toronto General Hospital, Ont, Canada. Department of Radiology, Hospital of Saint Raphael, New Haven, CT.